It’s that time of year when the final flourish of some crops presents a headache. Those extra rows of late-planted beetroot, more than can be eaten by the family, need to be properly stored; but the consistent temperature required and all that mucking around with boxes and sand make it easier to give it away. The glut of suddenly reddened hot and sweet peppers from the greenhouse is more than even the most ardent heat-seeking foodie can stomach. And the apples; oh, the apples… The answer is, of course, preserving. If you’re pushed for space - as we are in our house - pickles, chutneys and relishes are a very easy way of putting any excess to good use. If you can grow it yourself, you can preserve it yourself. Roast at 200 C for 50 – 90 minutes, or until soft. Stir the sugar into the vinegar. Peel away the beetroot skins then slice. Pack into warm sterilized jars. 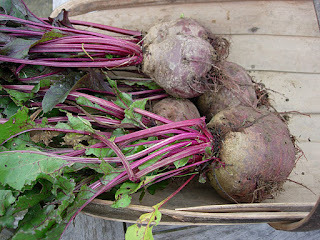 Pour in vinegar to cover beetroot..
Seal and shake jars lightly. Leave at least a month before using. Will keep for 6 months but refrigerate after opening. Add all ingredients into a jam pan. Slowly bring to the boil. Simmer for 40 minutes or until thick. Add to jars and seal. Leave for 3 months before using. Will keep for a year but refrigerate after opening. Stir the sugar into the vinegar in a jam pan over a low heat. Add the chillis and peppers.